I do not believe it. Really I don't. I feel like Victor Meldrew, a British sitcom character beloved by grumpy old Englishmen for his incredulity at the spanners life threw his way and the incompetence of everyone he came into contact with. Why am I so miffed you ask? Smithandnoble's replacement shade arrived at lunchtime today. Those paying attention to this saga will recall that in October I ordered four red silk roman shades for the dining room. 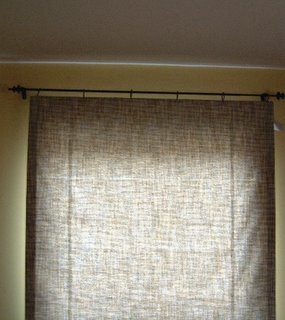 When they came, three had white splotches on them so I sent the whole lot back and ordered three shades for the den in one fabric and one for my study in a different fabric. The den ones weren't great quality but at least they functioned as shades i.e. they went up and down but the fourth was lacking that essential part of blind structures- a locking mechanism. So it went back and I waited for another shade and guess why I am exasperated today. No, go on guess. Correct they have delivered a shade with exactly the same defect. When I rang them they were incredulous, this never happens they assured me. I think they think I am some sort of imbecile who cannot operate a roman shade. But wait I have three others and I can open and close them so maybe the fault lies with their manufacturer. Or as I believe, they opened the package that I returned, looked at the front side, thought well it looks ok, I don't know what the problem is, and RETURNED THE SHADE TO ME IN A NEW BOX. My reason for this suspicion? One of the rings that the shade hangs from is bent in exactly the same position as the shade I returned a week ago. Coincidence? I don't think so.